Awww, they look great! Guys, are they together? Gabby is back to work! 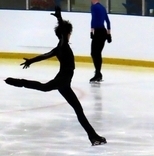 Wow, is that a new combination from Gaby? I've always suspected they are, but just don't make any public mention of it. She jumped the 3Lz-3T earlier this season in her SP (and also last season) but she was struggling with UR's and DG's. I hope Gabby does that combo in competition. I know she gets +3s for her 3t3t, but if she could master this one with the same height, flow, consistency she would really be doing herself a favour. Glad to see her back on the ice and looking strong this early. Hope the off season is good to her and she ups the ante now that confidence is on her side. New article on Patrick supposedly mentioning his plan to include 4F. Just saw that. Good for Patrick, he's not going to sit back anymore. I'm actually very impressed by this 'old dog' refusing to back down. Good for Patrick. There is no reason for him to play it safe, so I commend him for giving it his last (most likely) best shot. I would love to see him do it and surprise the heck out of so many people. As for Stephen... so excited to see where this kid will go. Growth, injuries... so many things could stand in his way, but if he gets through that, wow, the world is waiting. The next few years will be so fun to watch as he progresses.